After Seven is a more challenging and exposed start to After Six. The climbing is polished, sustained and at times thin. The 5.8 crux consists of thought-provoking moves a body length above the last piece of gear. 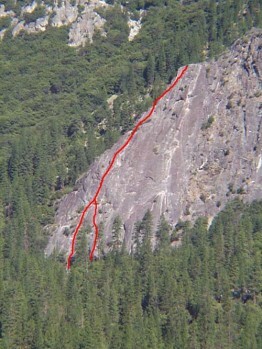 This climb offers a great way to pass slower parties on the first two pitches of After Six. Which SuperTopo guidebooks include a topo for After Seven?